Namibia is soul-stirring. Here on the southwest edge of Africa, orange sand dunes rise a thousand feet high against a cobalt sky. Inside are diamonds, tucked into the mountains of sand by currents, waves and wind. The coastal desert is washed by the relentless ocean, while inland the sun bakes the plains into a cracked puzzle of dried mud, pocked with enough grass and thornbush to sustain desert rhinoceros and other rare species. Raptors on high survey arid canyons that slice through vast plateaus. There is water here, too, though its presence is subtle. It is the source of life in the stark Etosha salt pan, whose waterholes attract great numbers of game pursued by feline predators. Springbok, oryx, kudu and dik-dik run to elude them in a great and ancient desert dance. An authentic encounter with nature is hard to achieve outside of a small group. While Namibia's paved road system encourages a more "bus-like" safari approach in many places, we limit our groups to just seven guests, allowing us to access remote areas that mini buses can't get to. We opt for light aircraft transfers to maximize your time with wildlife, rather than negotiating rough and dusty roads between destinations. And from the air, you'll gain a whole different perspective on Namibia’s dramatic landscapes. Private reserves are essential to an optimal Namibia safari. From the million-acre Palmwag Concession to the Ongava and Kulala wilderness reserves—private concessions adjacent to national parks—we view abundant wildlife away from crowds (most visitors are traveling on paved and gravel roads inside the parks). When we do visit the national parks, we enter prime wildlife-viewing areas quickly and return to our private reserves for a much quieter experience. We also enjoy exclusive activities not permitted in the parks, such as safari walks and night drives. And from fly-in Desert Rhino Camp, we have the rare chance to track endangered desert rhinos alongside conservation experts and researchers. Guided bush walks are available on private reserves—rare opportunities to stretch your legs while on safari. Track rhino on foot during our stay at exclusive Desert Rhino Camp, a remote outpost that gives you the best access in Namibia to view this endangered species. And consider an optional climb up the sand dunes at Sossusvlei for a perspective on the landscape that most safari-goers confined to vehicles miss. We limit our capacity to just seven travelers per vehicle on wildlife drives, assuring unimpeded views, maximum comfort and the best photo opportunities. In the Sossusvlei region, we explore in spacious closed vehicles that provide protection from wind and sand, with eight cushioned seats plus ample room for your gear. In less-sandy regions, our private chartered safari vehicles have open sides (no glass to interfere with your view) and 10 cushioned passenger seats—one in front next to the driver, followed by three rows of three seats each...lots of extra room for all! The isolated luxury camps we've chosen are truly exceptional. Each is seamlessly integrated into the natural environment in a way that allows you to be fully absorbed in the landscape. Each tent or chalet also has a private veranda for personal wildlife viewing opportunities. We are proud to include a stay at rarely visited Desert Rhino Camp, located within the distant wilderness of the Palmwag Concession where many of the world's last desert rhinos still roam free. We are proud to provide the personalized service of some of Namibia’s top naturalist guides. We employ only the most highly trained and experienced Safari Expedition Leaders, who accompany your group from start to finish. Rather than relying on less-qualified local camp guides at each stop, our NHA Expedition Leaders are the best-trained guides in Africa, averaging 15 years' experience, with additional resources provided by WWF’s leading scientists. See Expedition Leader bios with traveler comments regarding the quality of our leaders. 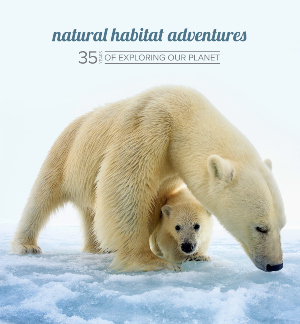 With Natural Habitat Adventures, you receive our exclusive guarantee, which clearly states that we will meet the lofty expectations we set in our promotional materials. To our knowledge, this is the most ambitious guarantee made by any adventure travel company. Read our important promise. Fill out the form below to receive additional information about our The Great Namibia Wildlife Safari or give us a call at 800-543-8917. Hi Nat Hab, I’m interested in your The Great Namibia Wildlife Safari. Can you please contact me with more information?